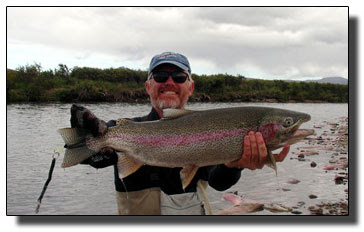 On Siberia Expeditions' trips 7 World records IGFA were set. Our equipment, lodging, hotels, meals and guides are the best available, and we, Siberia Expeditions, are committed to make your trip with us the greatest adventure of a lifetime. We like clear, mountain rivers with plenty of fish. We fish in places that many regard as extreme, and that demand a certain amount of effort to reach. Most of our trips are fly-in, fly-out. It also means bigger fish. Less expensive are fly-in, drive-out trips. We are constantly on the lookout for the new places to fish, tougher adventures and bigger challenges. For our trips we hire MI-8 helicopter with best chopper drivers imaginable, who have been working with us for a long time. Regardless of your own medical insurance, Siberia Expeditions provides medical insurance (25 000$ worth) per each client, that is included into the trip package. We have several GPS units and powerful satellite phones. All of our clients are granted 10 minutes free to call home from the river. The clients are calling our trips "fishermen's paradise, complete with gourmet foods". We take plenty of fresh meat, chicken, Kamchatka crab, scallops, sturgeon caviar, smoked salmon, lots of cheese and sausage in our ice chests, green tea, coffee, cookies and chocolate, good vodka, wines, Japanese beer, fresh fruits and vegetables, so the cooking is exceptional, as well as the fishing. 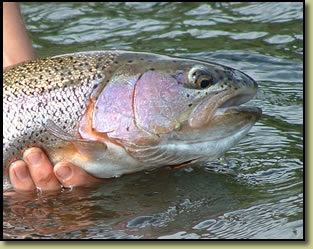 Taimen is a catch and release species. Large Taimen grow very slowly and could be 60-80 years old. Some of the other species (lenok, grayling, salmon) will be kept on a limited basis for camp specialty dishes. The best group size is 6 people. The group size is limited due to safety reasons per weight restrictions of the helicopters. Upon request, smaller group sizes can be arranged at an additional per person charge. Anui river, a tributary of the giant Amur, flows out of Sikhote-Alin mountains, east of Khabarovsk . It is a wild, clear, free-flowing mountain river,surrounded by virgin forests of birch, oak, larch and Korean pine. Gravely bottomed, with wadable stretches, that are perfect for fly fishing, the Anui has Taimen up to 100 lb., with 20-30 lb. the average range. Huge lenok (30-35 inches) and fat Amur grayling are abundant, presenting real Record book opportunities for ambitious anglers. Anui river itineraryDay 1 Arrive Khabarovsk , transfer to the airport, helicopter to put –in (1 hour 30 minutes flying time). Lunch. Get the rafts ready for float. Fishing. Set camp. Dinner. Shower. Overnight. Day 2 Raft and fish, camping in tents on gravel bars. Day 3,4,5 Raft and fish, camping in tents on gravel bars. Day 6 Fishing till lunch. Lunch. Helicopter flight to Khabarovsk . Transfer to the hotel. Rest. Dinner at Japanese restaurant. Day 7 Breakfast at the hotel. Time for shopping. Transfer to the airport. Flight back home. In the past years we have caught and released 5 largest Taimen (all existing IGFA line class and all-tackle records). These fish were all taken in Tugur river system. A very remote, tea-colored lowland river, located 4 hours by helicopter west of Khabarovsk . It's for truly serious World record seeking anglers only, as this is the expedition for Taimen true believers. Besides the obvious record book opportunities for huge Taimen, Tugur also has lenok, Amur pike, grayling and chum.Day 1 Arrive Khabarovsk . Transfer to the airport. Helicopter to the river (3.5 hours flying time). Set camp. Dinner. Shower. Overnight. Day 3,4,5,6 Raft and fish, camping in tents on gravel bars. Day 7 Breakfast. Flight to Khabarovsk . Transfer to the hotel. Rest. Dinner at the Japanese restaurant. Day 8. Breakfast at the hotel. Time for shopping. Transfer to the airport. Flight back home. The right is reserved by Siberia Expeditions to cancel or alter any itinerary, as current conditions require. The company or travel agents, booking these tours will not be responsible for any expense due to delays or cancellation of transport in these packages. Weather greatly influences when and if helicopter will fly. We will have secondary option in case of prolonged bad weather, but cannot accept responsibility for this or other acts of nature. Should you have to spend an additional night, you will be responsible for your own hotel and meal cost. Siberia Expeditions will not assume any additional expenses. A 50 % deposit is required to confirm a reservation. Balance is payable 60 days prior to departure. Pre-trip information will be sent upon receipt of deposit.